All kinds of buildings, regardless of age or type of construction, are vulnerable to infestation and damage by carpenter ants. Carpenter ants are very difficult to control. Colonies can contain up to 50,000 workers. 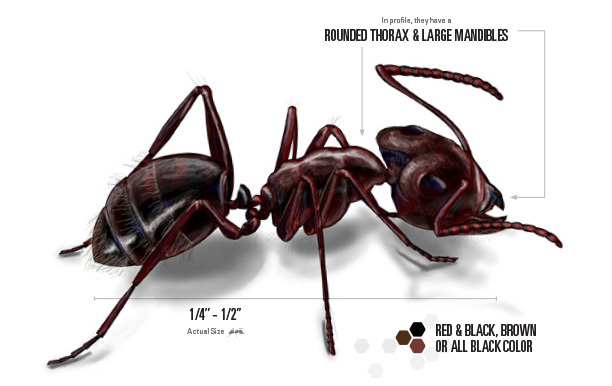 Length: Carpenter ants are among the largest ants in the United States, ranging from 3.4 to 13 mm long. More size information. Color: The most common color is black, but some species have reddish or yellowish coloration. The color also varies among species, ranging from jet-black to dark brown, red, black, yellow, orange, yellowish tan or light brown. 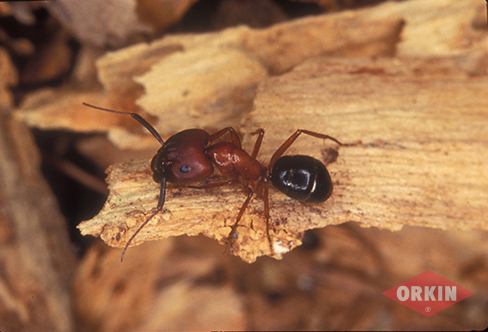 Some ants exhibit both red and black coloration. Mandibles: Workers have large mandibles. Read more about carpenter ant identification. These insects usually build their nests in damp, sound or decaying wood. Homes with moisture issues caused by leaks are prime targets for carpenter ants. The pests will also use tree branches that overhang roofs as a bridge, accessing buildings to find a way inside. Unsealed openings around utility pipes and wires are common entry points. How Serious Are Carpenter Ants? When carpenter ants build nests, they dig out tunnels in wood, weakening it from the inside. A long-term infestation with multiple colonies in a home often means serious structural damage and unsightly cosmetic damage. 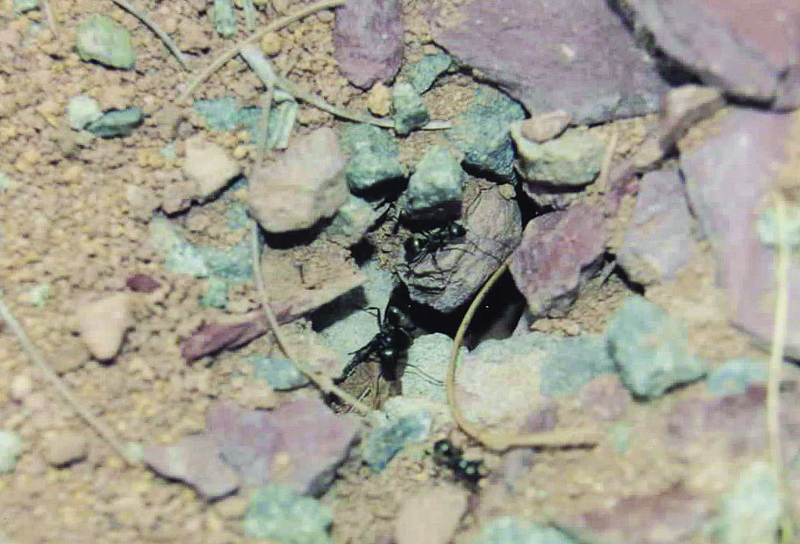 Workers and swarmers (winged ants) are the most likely sign homeowners observe. 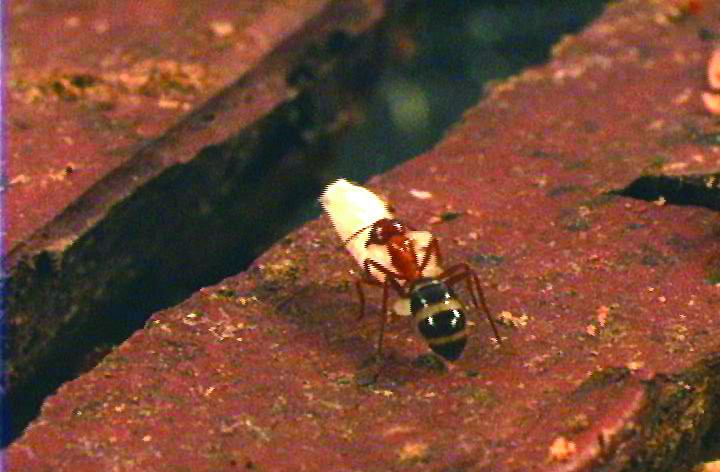 Workers: The workers may be observed foraging for food. Swarmers: Swarmers usually are produced when a colony matures and is ready to form new colonies. These winged individuals often indicate a well-established colony. Debris: An additional sign of activity is the debris they produce from tunneling in the wood. Rough wood shavings mixed with parts of dead ants from the colony indicate nesting activity. Sound: A final sign may be the “rustling” sound sometimes heard as the ants go about their activity in the home’s wood. If treated early, serious structural damage to houses and buildings can be avoided. However, these ants could damage structures immensely if they continue undiscovered for an extended period. DIY control methods often involve incorrect procedures that can allow the colony to rebound when surviving members resume their burrowing and foraging. Carpenter ants do not eat wood as termites do, but instead remove wood and deposit the debris outside of their nests in small piles. They will feed on a variety of food people eat—particularly sweets and meats. They will also feed on other insects. In natural environments, carpenter ants dwell in both dead and living trees, stumps and rotting logs. However, they may also establish their nests inside of homes and buildings where wood is found, especially where wood has been exposed to severe moisture. Queens lays 9 to 16 eggs the first year and may live up to 25 years. Eggs complete their life cycle in about 6 to 12 weeks. Ants of the genus Camponotus are known as carpenter ants because they prefer to establish their colonies in galleries excavated from damp or damaged wood. They cut galleries into the wood grain to form their nests and provide passageways for movement from section to section of the nest. This activity produces wood shavings mixed with parts of dead ants which provides clues to nesting locations. Carpenter ants clean their nesting sites, and their galleries are not lined with mud or moist soil as termite galleries typically are. The workers keep their galleries as smooth as sandpapered wood. Carpenter ants build two types of nests: parent colonies and satellite colonies. Parent colonies consist of a queen, her brood, and workers. Satellite colonies consist of workers, older larvae, and pupae. Workers create satellite colonies when the parent colony lacks sufficient space or when there is a suitable supply of food or water. There may be several satellite colonies associated with a parent colony.